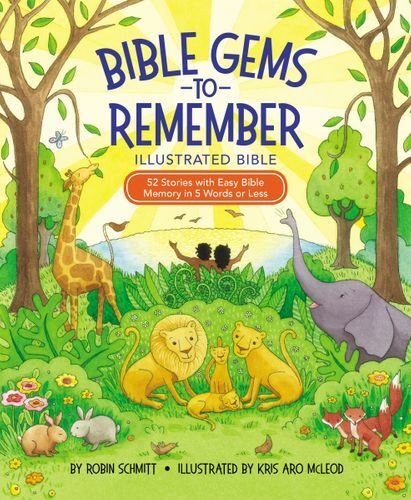 Bible Gems to Remember Illustrated Bible, written by Robin Schmitt and illustrated by Kris Aro McLeod, takes children through 52 stories from the Bible. Each includes a powerful gem or from Scripture to memorize, a Bible story with colorful and rich illustrations, and more related gems to ponder at the end. By the end of the year, children will have learned over 52 Bible gems! God can accomplish amazing things with just a few words. Imagine what he could do in the heart of a person who memorizes and meditates on short “gems” of wisdom from the Bible. Scripture is filled with these “gemstones”—concise statements of five words or less that hold great value, meaning, and power.